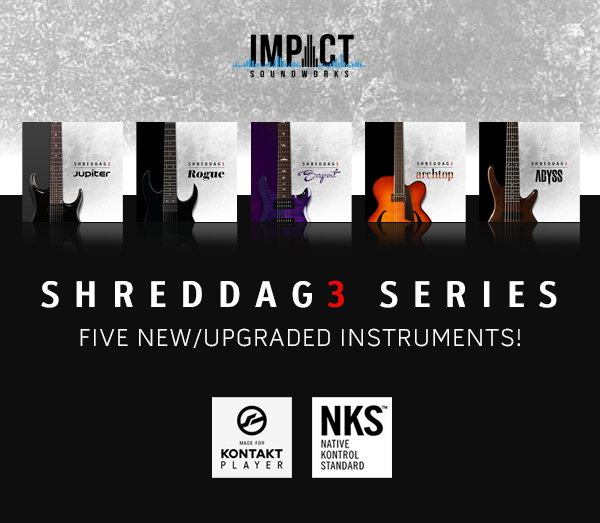 Impact Soundworks gave us a free taste with Shreddage 3 Free and now they’re back with newer versions. FULTON, MD — Audio software developer Impact Soundworks released today five new additions in their SHREDDAGE 3 series of virtual guitar & bass instruments: Jupiter (7-string heavy rock & metal guitar), Archtop (6-string hollowbody), Rogue (7-string Japanese metal guitar), Abyss (custom 6-string bass), and Serpent (7-string American guitar). Each Shreddage 3 guitar is available now for KONTAKT PLAYER with full NKS compatibility at the list price of $149, while Shreddage 3 Abyss is priced at $99. These five virtual instruments are complete upgrades from previous Impact Soundworks releases, taking existing sample libraries and re-programming them for the powerful S3 Engine with a wide variety of improvements and new content. Shreddage 3 Jupiter supersedes the wildly-popular Shreddage 2, Shreddage 3 Archtop upgrades from Archtop, Shreddage 3 Abyss is an evolution of Shreddage Bass 2, Shreddage 3 Serpent overhauls Shreddage 2 SRP, and Shreddage 3 Rogue replaces Shreddage 2 IBZ. Built on nearly a decade of experience sampling and programming virtual guitar & bass instruments, the Shreddage 3 engine offers extremely detailed samples, realistic performance playback, a fully-modular mixer, FX rack and pedalboard, plus extensive editing controls. Each guitar is recorded clean for maximum flexibility in tone, and with the new built-in Console tab, users can mix and match between 30 different effects (pedals, amps, cabs, and more) plus 30+ custom cabinet IRs, all without using a single external plugin. “After the success of the first Shreddage 3 release Stratus last year, we’re extremely excited to be bringing five of our most popular existing instruments to this new platform,” said lead developer Andrew Aversa. “Every aspect of the instruments has been improved, from mapping and performance to editing. We even recorded new samples for instruments like Shreddage 3 Archtop to make it more versatile than ever.” All Shreddage 3 instruments come with a set of custom tone presets to provide instant inspiration. These Kontakt snapshots range from ambient clean tones to hi-gain, heavy metal sounds, and all can be easily tweaked, copied, and shared with other S3 users. With Console, it’s even possible to save specific FX or pedal chains in one instrument and load it in a different Console-compatible instrument altogether.